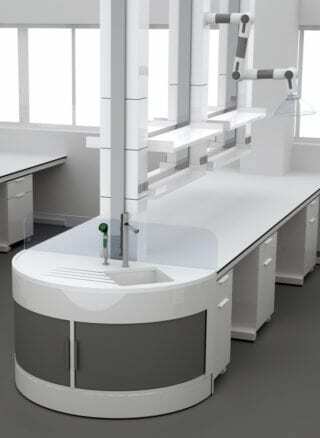 The biggest energetic consumption in the Laboratory world are related to the air conditioning and ventilation. That´s why it is necessary the existence of fume cupboards and other extraction elements used as individual protection devices. The tendency of using ventilation systems that lead to have an important number of air changes per hour in order to guarantee the safety of the users imply to have HVAC Equipment for big flows. Therefore, the activities to be carried out in this area in addition to the zoning according to climatic orientations and schedules are meant to reduce the air conditioning and ventilation demand and the integration of extraction elements operating system together with the HVAC of the building. We have Ultra Low air flow Fume Cupboards with a controlled ventilation system upon demand that allow to adequate the size of the production equipment to the real demands considerably reducing the ecologic track of the building.